Want to quickly see how the open-source software MDPro works? You'll find a free and updated demo installation of MDPro here. We are currently updating the MDPro demo. Please check back shortly. There will be a new version up soon. 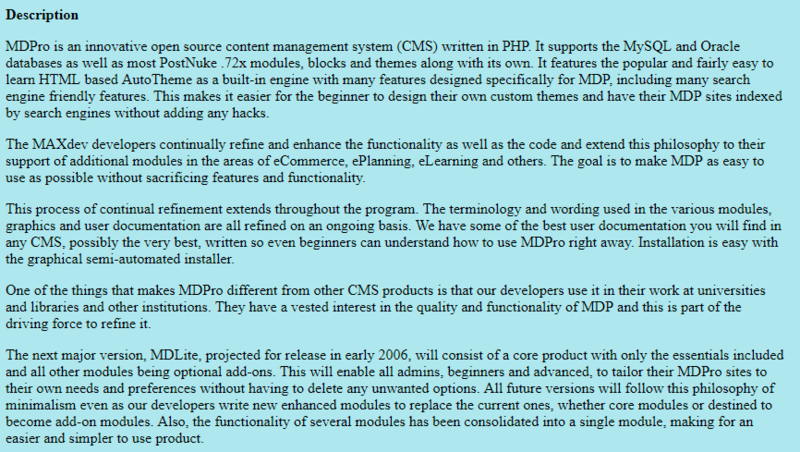 MDPro CMS is a free open source content management system built in PHP that supports MySQL and Oracle databases. Since its launch, developers have been working constantly on improving MDPro CMS features, adding modules for eCommerce, ePlanning, eLearning and more. You can download the software and create your own MDPro CMS demo using the link below. This way you’ll get a better understanding of its capabilities. Another cool thing about MDPro CMS is that you can customize the appearance of your demo site thanks to the built-in-templating system based on AutoTheme, with features designed specifically for MDP. The latest version available for download is 1.0.76 and was released on August 20, 2009. MDPro CMS is no longer being developed or maintained.